Finance for Change seeks to transform the financial system so that resource constraints and climate change are better integrated by investors exposed to country level risk. Our groundbreaking research and collaborations are influencing credit rating agencies and are encouraging a robust policy response on the part of national governments who want to protect their economies from negative economic impacts. Investors are increasingly aware of the impact of climate change on their portfolios but to date have primarily been focused on equity investments. With nearly 200 countries committing to taking action to limit climate change to 2 degrees Celsius, it is also imperative that investors understand the effect of climate change on the $40-trillion sovereign bond market. This need is particularly acute in France, which is the first country to require institutional investors to disclose the carbon exposure in all asset classes, starting in 2016. Global Footprint Network and South Pole Group created the Carbon Disclosure Working Group to support asset owners and managers by developing a clearer framework for climate assessment and carbon disclosure in sovereign debt and facilitating greater disclosure to improve risk management. While methodologies have been developed to measure and manage the carbon footprint for corporate equity and debt, no standards for carbon disclosure of sovereign bond investments exist yet. The Working Group addressed this gap by outlining a recommended approach for carbon disclosure and dashboard of indicators. The results are detailed in a report released in December 2016. Learn more here. For more information, please contact Susan Burns, susan.burns@footprintnetwork.org, +1-510-839-8879. 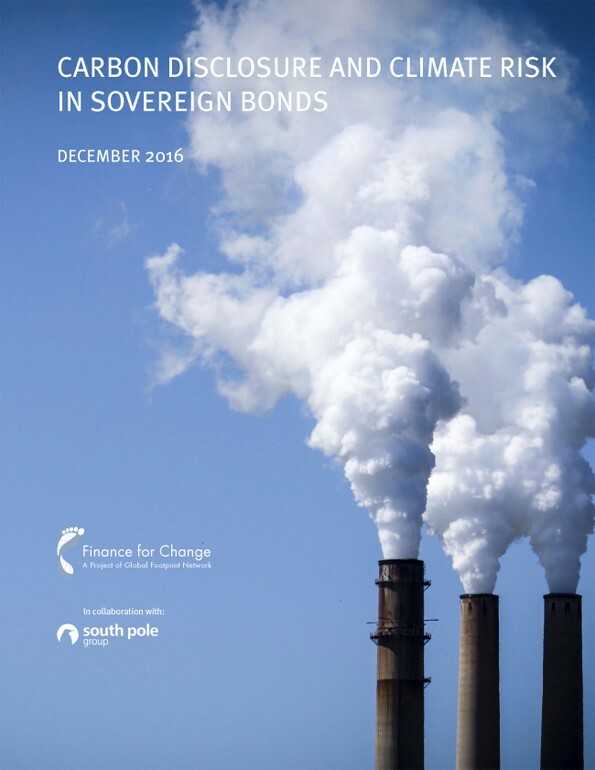 A new report by Global Footprint Network, Carbon Disclosure and Climate Risk in Sovereign Bonds, outlines a methodology for investors to disclose and manage carbon exposure in their sovereign bond holdings. Until now carbon disclosure has focused mostly on listed equities and to a lesser extent corporate bonds. Yet sovereign bonds represent one of the largest asset classes and a significant percentage of diversified investment portfolios, especially among institutional investors. A growing imbalance between rising demand for food and the capacity to supply it, driven by factors including climate change and population growth, will result in higher and more volatile food prices and a higher likelihood of food price shocks. 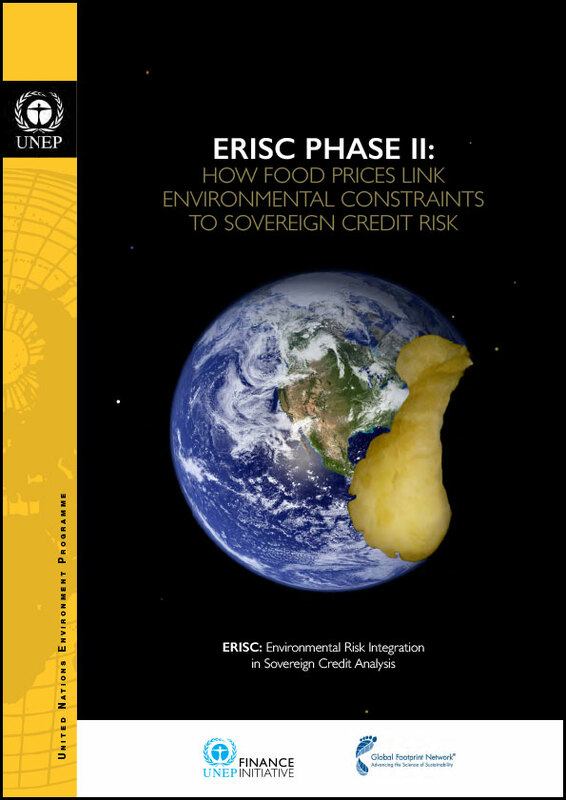 This report, produced in collaboration with UNEP FI, includes a ranking of 110 countries' vulnerability to a major food price shock, based on the impact of a food price shock on Gross Domestic Product (GDP), Consumer Price Index (CPI), and current account balance. 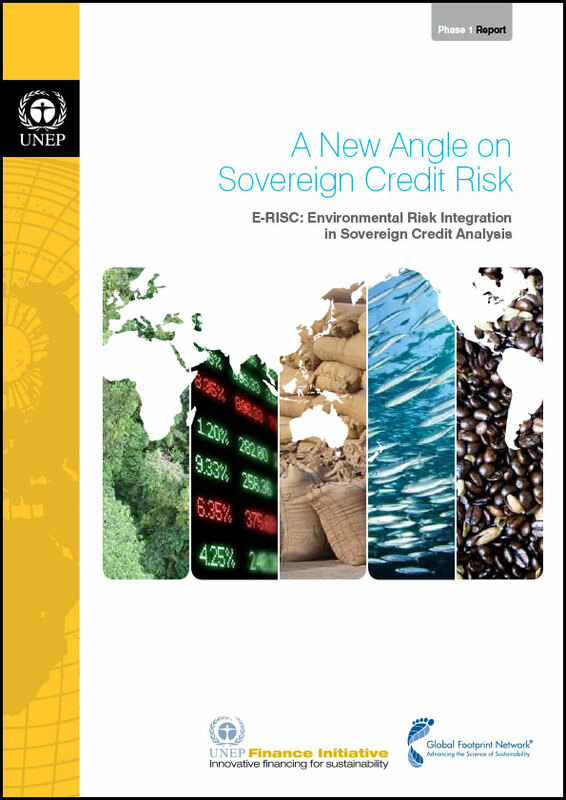 ERISC Phase I, published in collaboration with UNEP FI, demonstrated for the first time that natural resource-related environmental issues can affect the economic and sovereign credit risk situation of countries in ways that can be identified and quantified. The research distilled the country risk profiles of Brazil, France, India, Japan, and Turkey.